Caesars have always had special tastes, from the one in Rome who demanded the finest foods/wine and the love of his subjects, to the one named Milan, who presumably tastes like a mix of Eukanuba and slobber. 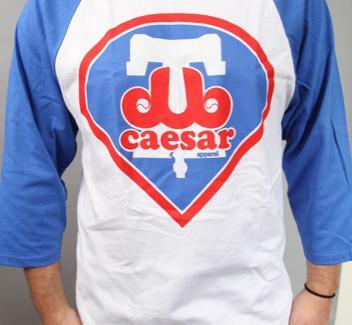 Knocking out designs that meet their own specific tastes, Dub Caesar Apparel. 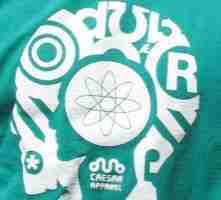 Out of Chester to the West-er, DCA's a wide-ranging line of tees and hoodies from a couple of self-ascribed "hustlers" who're designing "to their own tastes, not what's hot at the moment", although now that they mention it, an in-use toaster t-shirt sounds kinda awesome. Original designs include the Crest, where the co's initials overlap within a pair of wings; Hip Hop State of Mind, featuring a lion-and-crown pattern intertwining with a busy gold background; and the Revolutionary, a splattered portrait of George Washington, who's on a horse...this shirt is now diamonds!! There're also some paying tribute to iconic looks, including Strains (their version of the Helvetica & ampersand list tee, w/ variations of a favored herbal supplement), a Run DMC tank and tee that swap the band name for DUB CSR, and a vintage Phillies logo port called Philly Pride, with "dub" spread across a baseball field, which hasn't really been done since Tony Tarasco retired. For the cooler months, they're hawking some hoodies and long-sleeve tees, and for all your hustler-loving lady friends, they're offering up a trio of designs along with the boombox-riffic Can I Kick It?, a question that'll get the taste slapped out of your mouth by Mr. Whisperer if you're pointing to a chow.